As we enter the final countdown to Christmas, it is only natural to start working a little less hard, and preparing for a relaxing week off - not to mention look forward to any gifts you might receive. But there's one man who can't take time off: Santa Claus. In addition to his promotional commitments ahead of the big day, posing for photos in shopping centres and appearing in Coke adverts and the like, the man himself has got to manage the delivery of presents ahead of Christmas Day. Which must be a bit of a nightmare. Traditionally, Santa has presented as a one man operation (or at least one man and some elves), but in order to get everything sorted in time, he must have some formidable technology behind him. So join us, as we speculate on the sort of technology he needs to ensure that we have a merry Christmas. The first problem Santa faces is delivering to everyone on Earth in one night. Luckily - thanks to the way timezones work, he has a whole 24 hours to do it, but how to do it? Hypersonic jets don't yet exist, though the airline industry is working on them. Back in October we learned about Airbus's plans for what has been dubbed “Concorde 2” - a craft that it is envisaged would be able to travel at mach 4.5 - and thus from London to New York in just an hour. The design apparently includes 3 engines, which are all powered by different types of hydrogen to reach a top speed of 3425mph. Crazily, the idea is that it would take off vertically like a rocket - in order to reach 100,000 feet in the air. The only downside? It doesn't look like there's too much room for luggage, of which Santa has rather a lot. Oh, and there is one more problem. A hypersonic plan just isn't fast enough. According to one calculation he needs to average 822.6 visits per second. So clearly he needs some help. The most effective distribution then might involve partnering with Amazon, which is already well on the way to developing its own delivery drone program. This would involve a “hub and spoke” model of distribution. Perhaps Santa could drop off gifts at distribution centres ahead of Christmas Eve, and then thousands of drones could do the final drops down chimneys? Even if you have a hypersonic jet though, or a tonne of drones, there is still the problem of maximising the efficiency of your route. If Santa has so many millions of places to visit, how does he know which to visit first? This is a problem that has haunted mathematicians for centuries - it is known as the travelling salesman problem, and computer scientists are constantly working to improve their software to optimise solutions even further. So perhaps the smartest thing for Santa to do would be to partner with one of the companies that is furthest ahead in this field: Uber. The taxi firm employs loads of data scientists to make sure their drivers are being fully maximised at all times (especially when you add the complexity of something like Uber Pool) - so it stands to reason that the same technology couldn't be deployed to optimise routes for a sleigh instead. The traditional Santa myth envisages the North Pole as a hub of toy manufacturing - with thousands of elves to help him out. But that doesn't really make much sense in the modern age. Given the complexity of modern gifts, is it really plausible that elves could make a PS4? Even if they could, there would be the huge risk of litigation from Sony's legal team. And on a practical level it doesn't make sense either: Given the complex supply chains required, it would make much more sense to locate the elves factories near a major international port - such as in China's Shenzen province, rather than at the North Pole, where there is little infrastructure and the small matter of the ocean freezing at Christmas time. So how can Santa get all of the gifts? Simple - he has to buy them. But where to get the cash? One facility that could plausibly be located anywhere, including the North Pole, is a server farm. So Santa should get hold of tonnes of servers and set them all running with software to mine the libertarian magic beans which are Bitcoins. Not only could it be a plausible way of acquiring the necessary cash on a large enough scale, but if anyone wants some drugs or an illegal firearm for Christmas he wouldn't even need to convert the currency and could simply buy them on the so-called “Dark Net”. Of course, though Santa is romanticised as jolly old Saint Nick, he isn't just an overweight, friendly man - he's super judgemental too. But where to get all of the necessary coal? Assuming Santa has managed to secure a coal mine (there are plenty in northern Canada, where it will also be suitably chilly for him), he'll need a Caterpillar 797 truck to lug it about. The latest version of the truck - the 797F, which has been produced since 2009, has a 4000 horsepower engine, weighs over 600 tonnes and is capable of carrying a payload of 363 tonnes. Though really isn't it about time Santa thought about switching his punishments to something a bit more environmentally friendly? Why doesn't he just set a public Twitter shaming mob on the naughty? One of the most important party of Santa's duties is figuring out who has been naughty or nice. But luckily, the technology for this already exists thanks to the world's increasingly draconian approach to what we view online. Santa needs to get himself a data centre like the one owned by the NSA in the Utah desert that will collect all of the world's web browsing and communication data. Given how much about our lives we now share online, analysing this bulk collection of our personal data should be able to paint an accurate picture of whether the people of the world deserve their gifts. But there are a couple of billion people that Santa needs to deliver to, so how can he do all of that analysis? Helpfully sentiment analysis tools are increasingly common. This is where by using algorithms and machine learning, computers can look at, say, the contents of an email or a Facebook post, and figure out the meaning behind it: Are you being horrible to someone, or being nice to them? Are you doing good or evil? 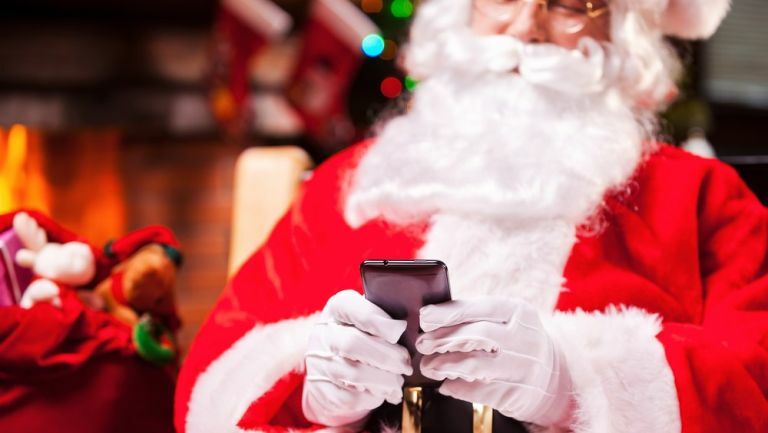 The algorithms will be able to score each post so that Santa can figure out whether you're getting an iPad or a lump of coal.